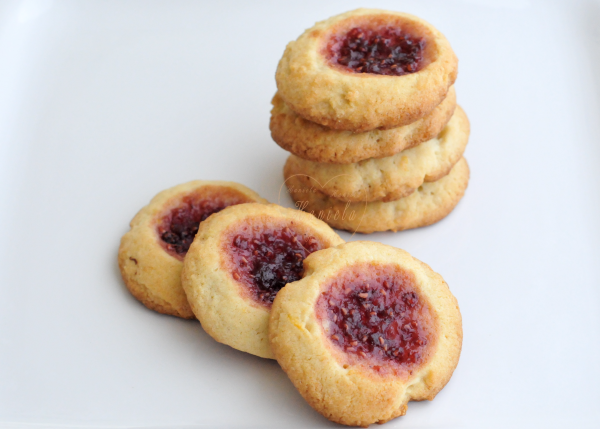 These cookies are delicious, I made them several times and they never failed me, they seem to be even better a day or two after they are baked. Preheat the oven to 350 degrees F. Line 2 baking sheets with parchment paper or silicone baking mats. In a small bowl, combine the jam and Chambord/I used limoncello liqueur/. Stir to combine. I make these around holidays for our friends and they love them.I package them in the clear bags with a pretty ribbon. To make the cavities I use wooden spoon handle that I sprayed with a bit of Pam cooking spray.